The world's top mutual fund managers say the U.S. stock rally is about to come to an end. More than half, or 58%, of 253 fund managers surveyed by Bank of America Merrill Lynch say stocks are the most overvalued investments in the world. That's up from 51% in an August survey. Many investors and market watchers have been confounded by the U.S. stock market rally of 2012 amid what appears to be slowing global growth. 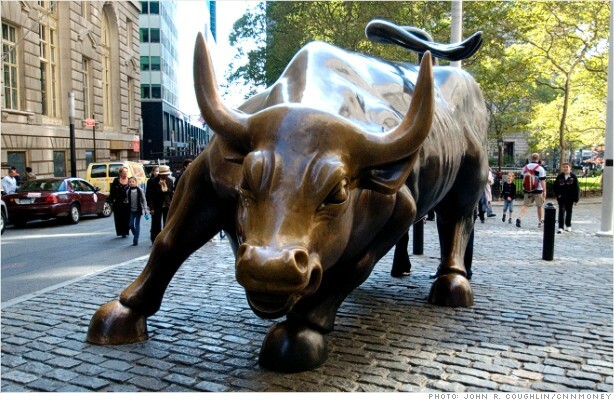 All three major U.S. stock indexes have inked double digit gains in 2012 with the Nasdaq (COMP) jumping 22%. What keeps fund managers up at night is potential inaction by Congress on the issue of the so-called fiscal cliff. "Investors now view the U.S. fiscal cliff as a greater threat than the eurozone -- and the upcoming election is putting these fears into sharper focus," said Michael Hartnett, chief investment strategist at BofA Merrill Lynch Global Research, in a statement. As fund managers become less worried about the European sovereign debt crisis, they're allocating more money to European equities, raising the amount invested in European stocks to the highest level since February 2001, according to the survey. In fact, fund managers have increased their position in European equities by double digits for three consecutive months. That marks the first time they've moved that aggressively into European stocks since the summer of 2009. European markets have also seen broad gains this year. Germany's DAX (DAX) is up 25% and France's CAC 40 (CAC40) is up 11%. "Any extension of the rally [in European stocks] is likely to be led by sector rotation and buying of unloved, domestically exposed stocks," said John Bilton, Bank of America's European Investment Strategist. Oil and gas and technology are the most loved European sectors, or where fund managers put the largest percentage of capital. The most hated: financials and real estate.